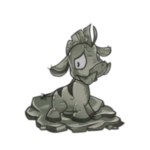 Tezu was a brown Kacheek and he wasn't anything out of the ordinary. He was fairly young, and like many of his friends his two main interests were food and sport. Oh yes, sport. Tezu hadn't really put much thought into what he wanted to be when he grew up, but if he could be anything he would be the star player for Team Meridell. He lived and breathed the Altador Cup, and today he was going to watch his first ever match. "I can't believe it," he was saying to himself as he skipped down the road towards the stadium. Dusk was falling, but his path was well-lit by the light of the moon and the torch he carried, emblazoned with Meridell's logo. He could hear the cheering of the fans already, even though the stadium itself wasn't yet in sight. "My first Cup match. I can't believe it!" "Excited, are we?" said a sour voice to his left. Tezu glanced over and saw a Neopet sitting in the shadows under an enormous oak tree. Most of his body was shrouded in darkness, so Tezu moved closer. "Are you lost?" the little Kacheek asked. "I can show you the way to the stadium if you'd like." 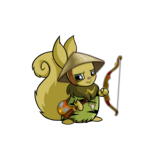 "I'm not lost," the shadowed Neopet grumbled, "and I'm not going to the stadium." "Oh." Tezu squinted into the shadows. "Well... is there a special reason why you're sitting in the dark?" "Reason?" was the growled reply. "I'll give you a reason, boy." There was a shuffling under the tree and the Neopet moved out of the darkness into the glow of Tezu's torch. The little Kacheek had to muffle a squeal. "Your – your arms –" Tezu stuttered. "What about my arms, boy?" the Ruki grumbled. In fact, 'arms' was almost the wrong word. They were no more than stumps that protruded from his shoulders, barely the length of Tezu's tiny paws. "Do they scare you? Do they frighten you? Do you see now why I was sitting in the dark?" Tezu was, indeed, shaking with fear. "I'll – I'll leave you alone," he stammered. "I'm very sorry to have disturbed you. I'll just go now." The Ruki nodded his bandage-covered head. "Of course you will," he muttered. "You're not the first. They all just walk away, shrieking at the very sight of me. But nobody cares if they hurt my feelings, do they? I'm already broken enough." Tezu bit his lip nervously. "Well, it's just... you see, the match is about to start, and I really don't want to miss it –"
"Of course you don't," the Ruki spat. "You're all the same. Go on, then. Off with you, boy. Enjoy your game – don't mind me. Nobody cares about an old, ugly Ruki." Tezu hesitated, biting his lip again. "Um... sir? If – if you wanted, you could come with me. I'm sure there's a spare seat for you in the stadium –"
"You think I want to come with you, boy?" the Ruki yelled, suddenly furious. "You think I want to watch a game after what happened to me? You think I want to be anywhere near it? That stadium is the last place in all of Neopia that I want to be. I will never go back. Not ever." "Go back?" Despite his fear, Tezu was intrigued. "What do you mean, go back? Did you used to play?" When the Ruki didn't respond with anything but silence, Tezu pressed him again. "Sir?" "My name's Brin, for all the good that will do," the Ruki muttered. "And I never used to play. Never got the chance." Brin stared at Tezu for a long while, until the Kacheek started to feel a bit uncomfortable. "Let me guess," Brin said slowly, after a long while. "You've been playing pretend Yooyuball since before you could walk. You have posters of every member of Team Meridell on every inch of wall in your bedroom. It's all your friends ever talk about, all you ever think about. Your one true dream is to be in the stadium one day – not looking on, but playing. Not cheering with the fans, but being cheered for. "I know how that feels. "I'm from Old Altador, boy; true Altador. My city was playing Yooyuball before you even knew it existed. I was born knowing the rules and the chants and the cheers. Like you, I thought I was born to play. "I was wrong. So wrong." "What happened?" Tezu asked. "Was it because of...?" He gestured towards the bandages wrapped tightly around the Ruki's arms. "I wasn't born this way, no. Before it all happened, I was better with my hands than any other Altadorian, and that was why I got the job I got. I worked with Yooyus, training them to play in the Cup. It wasn't easy. My hands got burned by the Fire Yooyus, or frozen by the Ice ones. And Darigan – don't get me started on Darigan Yooyus, boy. 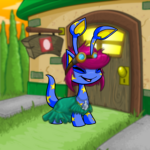 There isn't a Petpet more dastardly and devious than a Darigan Yooyu." Tezu nodded. He'd heard all the stories. The old Ruki cleared his throat. "It was challenging, but it was rewarding. For a young Yooyuball fanatic, it was a dream. I got to meet all the best players and watch all the matches from up close. And then one day..."
Brin sighed. "They brought in a new type of Yooyu. A new technology. They swore it would make the game bigger, better and more exciting than ever before. They called it the Clockwork Yooyu, but it wasn't a Yooyu at all – it was a toy, a mechanical replica. It wouldn't need training and wouldn't suddenly veer off-course like some of the other types were prone to do. It was the perfect solution. And they gave it to me to test. "It wasn't perfect at all. Far from it, in fact. They didn't know what they were doing when they programmed it. Now, of course, the explosions aren't real – just a bit of noise and smoke to give the crowd a show. But back then... Back then, the explosions were very real." Tezu gulped. "So that's what happened to your arms..."
"Yes," Brin answered. "My arms and all the rest of me. I'm burned and scarred all over underneath these bandages. Nobody wants a Yooyuball player who can barely walk, let alone one without arms to throw a Yooyu. My all-star career was over before it had even begun, and I couldn't go back to working with Yooyus either. I found it too painful... emotionally as well as physically." The little brown Kacheek could only stare. The screams and shouts from the stadium in the distance had faded away. Now there was only this poor, old, broken Ruki, who had lost all hope and joy in his life. Tezu was only a young Kacheek and he wasn't anything out of the ordinary, but whenever he wanted to find hope and joy, there was one thing he could count on. The Altador Cup never failed to make him happy, no matter what had got him down. Brin had sworn he never wanted to go near a stadium again, but Tezu suspected that there was only one reason why anyone would be out on the road at this time, even if he was standing in the shadows. There was something in the old Ruki that wanted to watch a match more than anything else in Neopia. "Here," Tezu said, and held out his ticket. Brin stared at his outstretched paw. "What's that, boy?" "It's a ticket for the match tonight," Tezu replied. "I don't think they've started playing yet. If you hurry, you might be able to make it in time." "I know what a ticket is," Brin said impatiently. "But you can't make it into the stadium without one." "I know that," Tezu replied, "but I think you need it more than me." Beneath the bandages, the old Ruki's face twisted into a smile. He reached up awkwardly with one of his forelegs, clumsily grasping the ticket. "I'm not too good at holding things just yet," he muttered. "Would you like me to walk with you?" Tezu offered. Brin nodded slowly. "I'd like that. You never know; there might be a spare seat." "If not," Tezu answered as they set off down the road, "I'll buy tickets for us both next time." Okay, maybe they're better as mascots.